Celebrate Independence Day at Outback Steakhouse! A gift card was given for review in exchange for posting. No other compensation was given. Ready for another amazing scoop from Outback Steakhouse? Here’s a hint: It’s time to let freedom bloom! Summer is in full swing, and we’re just a few short days away from a very special holiday: July 4th! It’s our nation’s birthday, and what better way to celebrate than with a meal with your mates at Outback Steakhouse! Fourth of July is one of my favorite holidays because it is a great day to get together with friends and family and have fun starting things on fire and making loud noises! :) I love that this holiday is one of the only ones in the summer so you usually get great weather to grill out, go on the lake, enjoy the beautiful weather and celebrate one of the greatest events in our country's history! This year, in pursuit of life, liberty and bloomin’ happiness, head in to Outback on July 4th and declare your independence from paying for a Bloomin' Onion®! No kidding! 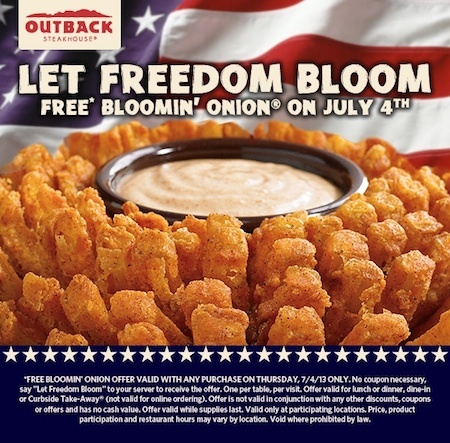 Outback is celebrating America's Independence Day by offering free Bloomin' Onions on July 4. Just say “Let freedom bloom!” to your server for your free delicious appetizer to share! In addition to the free Bloomin' Onion, they are also offering a Military Mates deal too! To honor Military Mates, Outback Steakhouse will continue to offer Veterans and active military 10% off the entire check when they dine at Outback for lunch or dinner, up until July 4, 2013. Thank you to our active and past military troops! We could not celebrate Independence Day without you!!! To find an Outback location near you, visit outback.com/Locations.